NASA Astronauts Michael Fincke (left), Catherine G. Coleman (center) and Gregory Chamitoff (right) introduce the Zero Robotics competition in 2011. After controlling small satellites in the International Space Station this morning (Jan. 11), two teams of high school students took home top prizes for their programming skills. The teams were part of the Zero Robotics SPHERES Challenge, an annual competition that asks students to program bowling ball-size satellites to perform maneuvers related to current space-exploration problems. This year's competitors had to mimic cleaning up broken satellites and other unwanted debris humans have put into orbit around the Earth, but haven't brought back down again. Such "space junk" increases every year, which is a problem for new satellites that people want to put into space. 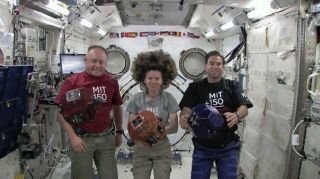 The student-written programs run in real testing satellites, called Synchronized Position Hold, Engage, Reorient Experimental Satellites or SPHERES, that zip around the cabin of the International Space Station. Every year, winners are announced among U.S. and European Union teams. In the United States, the winning team included students from Montclair High School in New Jersey and the Evergreen School District in Washington State. In the EU, the top prize went to a team of students from the Enrico Fermi School in Italy and Herder-Gymnasium in Germany. This story was provided by TechNewsDaily, sister site to SPACE.com. Follow TechNewsDaily on Twitter @TechNewsDaily, or on Facebook.